I was recently sent over some of the Sainsbury's makeup line "Boutique". Most of you will know I am a high end girl at heart and I don't tend to buy too much drugstore makeup. However, today, I thought I would review a variety of the products by Boutique and what my thoughts are on them. I am an avid wearer of MAC's Velvet Teddy and when I was sent Boutique's lipstick in Rose in the Desert I thought it may be a dupe. The shade itself is quite a red toned brown which is very similar to velvet teddy however it is not matte. The Boutique lip liner in Seal Ones Fate reminds me a lot of MAC's Spice Lipliner and is a great dupe if you do not want to spend £13 on a lipliner. I personally do not wear lipgloss that often however, the Boutique lipgloss in Lip, Lip, Hooray is lovely. The Boutique Happy Go Lucky blush is a lovely, cool toned and easy to wear blusher for day to day. This shade is a very cool toned pink with a matte formulas. This blusher reminds me a lot of MAC's blusher in Well Dressed so this is a great alternative if you do not want to spend £19 on a blusher. Generally, I was slightly unimpressed with the eyshadows, whilst they are very pigmented they are very powdery and do not last well on the eyes even when I used primer. I would give these a miss from the range unless you are on a tight budge and do not mind something natural. Overall, I think Boutique by Sainsburys has a lot of great, bargain buys and there is something for everyone. 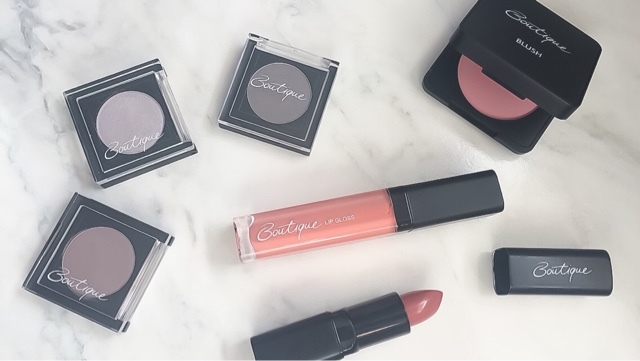 Let me know if you have tried Boutique? Hmmm interesting. They look like pretty decent products in the pictures. Maybe some are worth giving a go. Thanks for sharing, this is the first I've heard/read about these. Rose in the desert is such a beautiful shade!